Their Royal Highnesses began day two of their visit to Cornwall in the beautiful town of Port Isaac today. The Prince of Wales, also known as The Duke of Cornwall when in Cornwall, enjoyed a walkabout in the beautiful town and received a lovely reception from local residents and holidaymakers. The Duke stopped in at Port Isaac’s RNLI station which has served the coastline for more than 100 years. While there, The Duke met Linda whose son was saved by the lifeboat crew during a daring rescue in 2012. Since 1967, the lifeboat here has been launched 653 times and saved 336 lives. The Duchess meanwhile visited the UK office of The Ideas Partnership, a charity which supports the poorest women and children in Kosovo. The Duchess witnessed first-hand the support The Ideas Partnership provides during a visit to Kosovo in March of this year. The Partnership offers educational and health support for women and children in Kosovo -- all of which comes from the support of Port Isaac’s community. Their Royal Highnesses reunited at the end of the Royal visit to Port Isaac at Nathan Outlaw’s Michelin Starred restaurant, Fish Kitchen, where they met the cast of ITV’s Doc Martin, which is filmed here in the town. Their Royal Highnesses then left Cornwall for Devon, where where they attended the Taste of the West’s 25th Anniversary Food Fair. 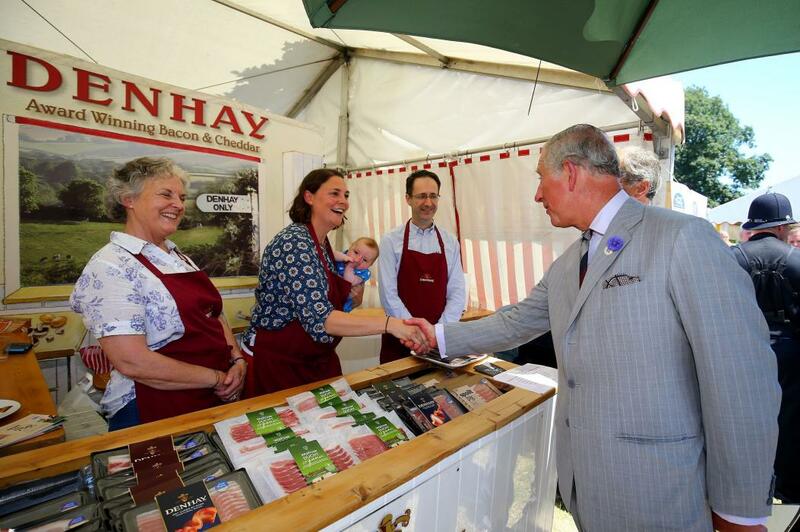 The Prince and The Duchess enjoyed sampling a handful of the best in local food and drink produce displayed by more than 60 GOLD award-winning food and drink producers. The Duchess then left The Prince for Exeter Cathedral, where Her Royal Highness attended a service of thanksgiving to mark the Children’s Hospice South-West’s 25th anniversary. The Duchess lit a candle in memory of children who have died in the years of the charity’s service. The Prince, meanwhile, visited a new development of affordable housing, managed by The Guinness Partnership, of which The Prince is Patron. These 15 new homes are built on Duchy of Cornwall land and are helping meet the local need for affordable housing. While on site, The Prince had the opportunity to join local residents for a cup of tea to hear how the new development has made a difference to their lives. Last stop for The Prince in Devon today was to Brimpts Farm, which has been a Duchy of Cornwall tenant since the early 14th Century. The Prince heard from Andy and Gabrielle, who run Brimpts Farm, and from other guests attending a reception held for His Royal Highnesses, about the various initiatives running in partnership with the Duchy, which are supporting farmers to become more profitable and sustainable.